Jackpot Capital Casinohas just begun another round of massive casino bonuses! 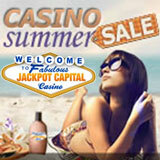 The $130,000 Casino Summer Sale will award $30,000 in casino bonuses every week until June 16th. Players anywhere in the world can qualify just by playing any of the hundreds of real money casino games in its online casino or mobile casino (m.jackpotcapital.eu in a smartphone or tablet browser). Earn double points when you deposit and play in the mobile casino on your iPhone, iPad or Samsung Galaxy S3/S. Every week hundreds of players will receive casino bonuses based on their scoreboard ranking -- up to $800 each. On Fridays, 50 randomly chosen players will win additional “Sizzling Steals” bonuses up to $150 each. 40 will be drawn from players on the scoreboard and an additional 10 players from those who haven’t reached the scoreboard by Friday. Jackpot Capital Casino is enjoyed by online casino players all over the world. Three Stooges II is one of its most popular slot games. users can also play Blackjack and thirteen of its most popular slots (including Three Stooges II) in its mobile casino.